Wot If? 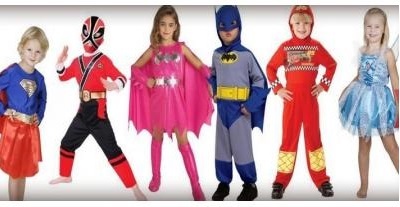 Costumes bring you an ever expanding range of top quality costumes to hire for fancy dress parties or just for fun! Fancy dress parties never go out of style - they're fun and entertaining, not to mention a great talking point. Showing up without a costume is definitely a faux pas, so don't let it happen to you! Save yourself the trouble of designing and sewing or wasting money on buying a costume - just hire it from Wot If? Costumes. Wot If? Costumes are here to help you express your style in fancy dress. Boasting a huge selection of costumes from movie characters to all time classics, you're sure to find a costume you love at Wot If? Costumes. With very competitive and affordable prices, hiring a costume for your mate's birthday or your themed work party is easier than ever before. We have everything you need for your birthday party, catering for all ages from children to 16th, 18th and 21st celebrations, to 30, 40, 50, 60 and higher! We also offer jumping castles, pinatas and mechanical bulls to add fun to your party! Wot If? Costumes are adding new costumes to their range every week, so if you've got a costume in mind, let them know and they'll track one down for you! Based in Melton, Wot If? Costumes is easily accessible from surrounding areas including Gisborne, Bacchus Marsh, Kurunjang and Melbourne's western suburbs. Open five days including Saturday, you'll always find time to pick up and drop off your costume in between work or errands. So whatever the theme of your next party, you're sure to find an amazing costume at Wot If? Costumes - call today on 0459 41# ### or visit the website.